...when a "hero" in the faith is the real deal: A genuine, gracious person who is everything in person that we hope they would be. Having met a few Christian leaders in my day, I have had enough disappointments to be wary when I am going to meet someone in person whom I have only met previously through writings. But these past few days reminded me of another time when I met one of my spiritual heroes and was so very pleasantly NOT disappointed. 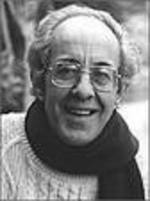 Nineteen years ago this month, I had an opportunity to meet Henri Nouwen. Nouwen was at the time, the most influential writer for my journey of faith. I have read virtually everything that he has written and his vulnerability, humility and spirituality was the tool that God used to inspire me to seek a deeper well of spirituality. So many of his ideas became wisdom that I have lived by. And meeting him was so very sweet. My friend Mark and I met him at Daybreak in Toronto. He gave us a tour of the facility, he showed us a huge copy of Rembrandt's The Prodigal Son and spoke of its meaning to him. He led a small worship service and served me communion (the only time as an ex-catholic that I have ever partaken of the Eucharist in a Catholic mass since becoming a protestant in college), he took us to lunch, he bought us pizza and beer and wine and we talked for hours. Then he gave us books. As many of his books as we didn't have. He was attentive, kindly, sweet and prophetic all at the same time. 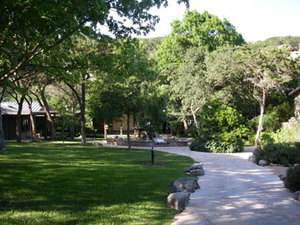 While my interaction with him was less personal, for the past few days I have been at Laity Lodge attending a retreat with about 50 other folks that was taught by Bishop N. T. Wright. Readers of this blog know of my high regard and deep appreciation for Bishop Tom. Now, having met him, my respect and regard is all the more. He is a brilliant man, a passionate teacher, a deeply committed, prayerful pastor who has only inspired me all the more to continue to study the Scriptures while listening to the deep hurts of the world. His scholarship is clearly in service to the church for the sake of the mission of Christ to the world. He was generous with his time, he signed our books and engaged in meals and conversations and answered questions with all who would wanted. He joined in worship, he attended the morning devotional and the late night worship and music service. His wife, Maggie, was charming and caring and funny. While I have many memories of my time years ago with Fr. Henri and have a number reflections and lessons from Bishop Tom, that I will certainly continue to glean and pass on through this blog in the days to come, I am sitting here today keenly self-conscious about how grateful (and I guess, relieved) I am that both of my "heroes" (and many others along the way through the years) have NOT disappointed me. I am more aware than ever of the profundity and high wire act of incarnation that is at the heart of the Christian faith. And how very painful and disillusioning it can be when a Christian leader disappoints. God's most risky strategy of using human beings as partners in the work of redemption and restoration has been so famously fraught with failure, but as G. K. Chesterton reminds us, every misstep by a Christian only affirms both the veracity of the Scriptural teaching of original sin and the truth that all human beings are fallen and in need of redemption. The Spirit of God offers us new birth and new life, but we do feel the effects and groaning of incompleteness and brokenness until Christ is fully formed in us. The theologian who communicates academic arrogance, the leader who comes across like a most worldly power-monger, the pastor who can't live out the faith he or she so passionately proclaims all leave a mark. We are more disappointed than most of us want to admit when our models and mentors don't measure up or seem more human than we need them to be. Recent biographies of Nouwen point out his battles with depression and his struggle with sexuality. I am sure that Bishop Tom has his share of oh-so-human attributes, too. I am not so naive as to need my spiritual heroes to be perfect and I pray that the small band of people who read or hear my words don't need me to be either. Christian faith is not simply a matter of a holy book, doctrines and lessons to learn, but about people living out these texts and incarnating the story so that it becomes a real and vibrant encounter of the presence of God through a human instrument. "The Kingdom is about asking: What would it look like if God was running the show?" Which is going to help me a lot with my answer to the 5 Kinds of Christians post that I put up before Thanksgiving. I am preaching at SCPC through Romans and found this passage from a sermon by my "sabbatical mentor", that helps us understand the magnitude of a text like Romans 8 (our text for this weekend). ..religion in the western world has been less and less about the renewal of creation and more and more about escaping from this wicked world and going to a better place, called ‘heaven’ – going there ultimately when we die, but going there by anticipation in the present through prayer and meditation. This essentially other-worldly hope and spirituality has fought its corner robustly against the materialism which has insisted that the only things that exist are things you can touch and see and money you can put in your pocket. But if you turn Christian faith into simply the hope for pie in the sky when you die, and an escapist spirituality in the present, you turn your back on the theme which makes sense of the whole Bible, which bursts upon us in everything that Jesus the Messiah did and said, which is highlighted particularly by his resurrection from the dead. A religion that forgets about new creation may feel some sympathy for the battered and bedraggled figure in the ditch, but its message to him will always be that though we can help him a bit, ultimately it doesn’t matter because the main thing is to escape this wicked world altogether. And that represents a tragic diminishing and distortion of what Christian faith is all about. The God in whom we believe is the creator of the world, and he will one day put this world to rights. That solid belief is the bedrock of all Christian faith. God is not going to abolish the universe of space, time and matter; he is going to renew it, to restore it, to fill it with new joy and purpose and delight, to take from it all that has corrupted it. ‘The wilderness and the dry land shall be glad; the desert shall rejoice and blossom, and rejoice with joy and singing; the desert shall become a pool, and the thirsty ground springs of water.’ The last book of the Bible ends, not with the company of the saved being taken up into heaven, but with the New Jerusalem coming down from heaven to earth, resulting in God’s new creation, new heavens and new earth, in which everything that has been true, lovely, and of good report will be vindicated, enhanced, set free from all pain and sorrow. God himself, it says, will wipe away all tears from all eyes. One of the great difficulties in preaching the gospel in our days is that everyone assumes that the name of the game is, ultimately, to ‘go to heaven when you die’, as though that were the last act in the drama. The hymn we’re about to sing ends like that, because that’s how most people have thought. But that’s wrong! Heaven is important, but it’s not the end of the world; God will make new heavens and new earth, and give us new bodies to live and work and take delight in his new creation. And the ‘good news’ of the Christian gospel is that this new world, this new creation, has already begun: it began when Jesus of Nazareth rose from the dead on Easter morning, having faced and beaten the double enemy, sin and death, that has corrupted and defaced God’s lovely creation. N.T. Wright, from a sermon entitled "The Road to New Creation." Here is the whole article of Tim Stafford's interview with N. T. Wright from which I provided some excerpts the week after Christmas. We end the "12 Days of a Wordless Christmas" with some words that remind us of all that we are to be, all that we are to be about, all that we are to do. For more on "Epiphany", see this and this. The key to mission is always worship. You can only be reflecting the love of God into the world if you are worshipping the true God who creates the world out of overflowing self-giving love. The more you look at that God and celebrate that love, the more you have to be reflecting that overflowing self-giving love into the world. N. T. Wright, Interview in Christianity Today, January 2007, 41. Our Western culture since the 8th century has made a virtue of separating out religion from politics. When I lecture about this, people will pop up and say, “Surely Jesus said my kingdom is not of this world.” And the answer is no, what Jesus said in John 18 is, “My kingdom is not FROM this world.” That’s “Ek tou kosmou toutou.” It’s quite clear in the text that Jesus’ kingdom doesn’t start with this world. It isn’t a worldly kingdom, but it is for this world. It’s from somewhere else, but it’s for this world. For generations the church has been polarized between those who see the main task being the saving of souls for heaven and the nurturing of those souls through the valley of the dark world on one hand, and on the other hand those who see the task of improving the lot of human beings and the world, rescuing the poor from their misery. The longer that I’ve gone on as a New Testament scholar and wrestled with what the early Christians were actually talking about, the more it’s been borne in on me that the distinction is one that we modern Westerners bring to the text rather than finding in the text. Because the great emphasis in the New Testament is the gospel is not how to escape the world, the gospel is that the crucified and risen Jesus is the Lord of the world. And that his death and Resurrection transform the world, and that transformation can happen to you. You, in turn, can be part of the transforming work. That draws together what we traditionally called evangelism, bringing people to the point where they come to know God in Christ for themselves, with working for God’s kingdom on earth as it is in heaven. That has always been at the heart of the Lord’s Prayer, and how we’ve managed to say the Lord’s Prayer without realizing that Jesus really meant it is very curious. What happened with the Enlightenment is the denarrativization of the Bible. And then with postmodernity, people have tried to pay attention to the narrative with paying attention to the fact that it’s a true story. It’s the story of the Creator God with his world. The great biblical story is fundamentally not like a parable of Jesus, which is true whether or not there was a farmer who had two sons. The overarching story of who Jesus was, the story of God and Israel and the coming of Jesus, has to have a historical purchase on reality. Otherwise, it is colluding with the very Gnosticism it is opposing. This particular story is about the Creator and the real world; it’s not about a God who is only interested in our interior reflections or our spiritual progress, the Gnostic worldview. N. T. Wright, Interview in Christianity Today, January 2007, 40. More of Wright's words for my "wordless 12 days of Christmas". This time on how the Living Word Jesus needs to "reform" our views of God. It is possible to say more or less all the orthodox Christian affirmations, but to join them up in the wrong story. It’s possible to tick the boxes that say Trinity, Incarnation, Atonement, Resurrection, Spirit, Second Coming, and yet it’s like a child’s follow-the-dots. The great story—and after all the Bible is fundamentally a story—we’ve got to pay attention to that rather than abstracting dogmatic points from it. The dogmas matter, they are true, but you have to join them up the right way. There’s a certain kind of modernist would-be orthodoxy, which uses the word “God” in something like the old Deist sense. He’s a distant, absentee landlord who suddenly decides to intervene in the world after all, and he looks like Jesus. But we already know who God is; now I want you to believe that this God became human in Jesus (we say). The New Testament routinely puts this the other way around. We don’t actually know who God is. We have some idea, the God of Israel, or of Abraham, Isaac and Jacob, we really haven’t understood who God is. That’s precisely what John says at the end of the prologue: No one has ever seen God, the only begotten who is in the bosom of the Father, he has made him known. John’s provided an exegesis for who God is. And in the Colossians 1, as well, (Jesus) is the image of the invisible God. In other words, don’t assume that you’ve got God taped, and fit Jesus into it. Do it the other way. We all come with some ideas of God. Allow those ideas to be shaped around Jesus. I want you to try to see yourself as part of the picture (the Bible has) painted. Or try humming one of the parts of the symphony that we’re writing, and see if it doesn’t make an awful lot of sense while nonetheless being very challenging. And that’s the apologist’s dilemma, that if you simply address the God-shaped blank that people think they’ve got, the God you end up with is the God shaped by the blank. The real God specializes in taking the blanks in people’s lives and pulling and tugging and turning them into a new shape. N. T. Wright, Interview in Christianity Today, January 2007, 39-40.